When you are planning a long running or walking workout, or trying to achieve your best time on a 10K or half-marathon, you need to know what to eat and drink for energy. Is an expensive energy bar any better than a Pop Tart or some trail mix? You need a source of carbohydrates for energy during endurance exercise, and that can be provided in several ways. 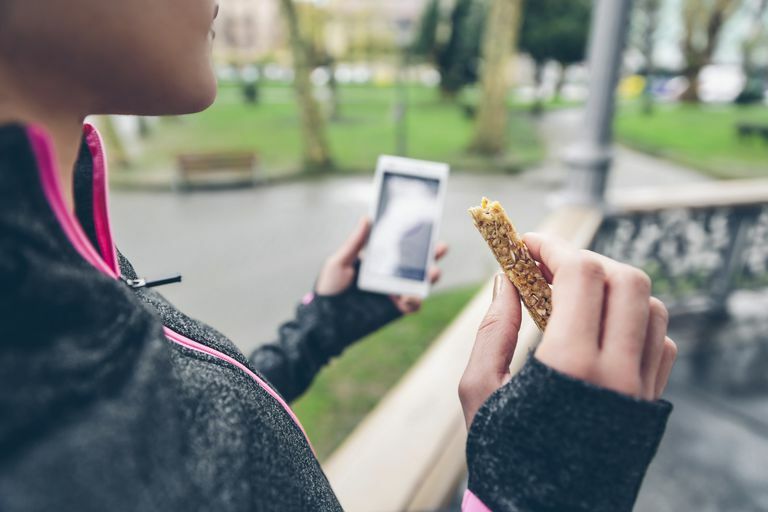 Energy bars and energy gels can be convenient, but they may not any better at improving endurance or performance than some lower-cost or homemade options. Energy gels are in convenient packets for squirting into your mouth and washing down with plenty of water. No chewing is needed, which reduces the risk of choking when you are huffing and puffing. They are a sugar boost, although brands have a different mixtures of sugars, each one touting itself as being more gentle on the digestive system than the others. You may wonder whether it makes sense to just water down some jelly, put it into a little squirt flask, and use that rather than spend a dollar a packet or more for sports energy gel. The good news is that energy gels have the same nutritional profile as a Jell-O Pop. If you choose to make your own, experiment with it on your longer walks and runs just as you would with the energy gels. You can spend $1 to $3 on fancy energy bars, each saying they provide carbs and protein in a magic mix. But most of them are no different from a Snickers bar or a Pop Tart. They can be convenient to carry along, so long as you choose one that is easy to chew, doesn't crumble, and doesn't have a coating that will melt in the wrapper. Avoid low-carb bars that use sugar alcohols because they can have unpleasant effects on the digestive tract, from nausea to loose stools. You do not want those symptoms during a long workout. You can save money by buying trail mix or using a recipe to mix your own trail mix from raisins, nuts, yogurt chips, and other items. Some energy bar companies, such as KIND and Larabar, are emulating trail mix in using only mostly nuts and fruit in their "whole foods" bars. Water is the best way to replenish your body when you are exercising for an hour or less. But if you are going for an endurance workout and you are sweating a lot, you need carbs and salt to replenish yourself. Sports drinks with carbohydrates and electrolytes provide these needed replacements when you are walking, running, or biking for over an hour. Many people drink more water when it is flavored. Add a bit of instant lemonade mix to your water bottle, or a squirt of lemon juice. Endurance athletes say that overly-sugared drinks such as fruit juices or colas can cause nausea. If sports drinks taste too sweet to you, experiment with different mixtures or make your own sports drink. Fancy energy gels, energy bars, and energy drinks may have a whole pharmacy's worth of herbs and supplements in them. But it's hard to separate marketing from science when it supplements. Two supplements have been shown to have any effect when you exercise: caffeine as a stimulant for endurance exercise, and creatine to build muscle (for strength training, not endurance exercise). You can often find energy gels that include caffeine, or you can get your caffeine from coffee. If you are a believer in other additives, save them till after you are done with your long workout rather than risking any digestive upset from them. You can save money by making your own energy snacks and sports drink, but there will still be times when it is more convenient to just buy it off the shelf. Find one that is less expensive, without unneeded supplements. Shop for taste as well as convenience. You might buy a full-size Clif bar because they are easy to chew—but the wrapper is very difficult to open. Cut them into bite-size chunks and carry them in a small sandwich bag. Carry along packets or small baggies of sports drink mix so you can mix it in your water bottle during your long workout. Afterward your workout, shouldn't you have a fancy recovery drink? Nothing high-tech is required as research says chocolate milk does just as good of a job, as would any drink that has both protein and carbohydrate. Reward yourself with a mocha latte or a frappachino and you'll be providing protein, carbs, and caffeine—the perfect end to a great workout. Higgins S, Straight CR, Lewis RD. The Effects of Preexercise Caffeinated Coffee Ingestion on Endurance Performance: An Evidence-Based Review. International Journal of Sport Nutrition and Exercise Metabolism. 2016;26(3):221-239. doi:10.1123/ijsnem.2015-0147. Kreider RB, Kalman DS, Antonio J, et al. International Society of Sports Nutrition Position Stand: Safety and Efficacy of Creatine Supplementation in Exercise, Sport, and Medicine. Journal of the International Society of Sports Nutrition. 2017;14:18. doi:10.1186/s12970-017-0173-z. Pritchett K, Pritchett R.Chocolate Milk: A Post-Exercise Recovery Beverage for Endurance Sports.Acute Topics in Sport Nutrition Medicine and Sport Science. 2012:127-134. doi:10.1159/000341954.